I just finished watching the 2005 documentary Enron: The Smartest Guys in the Room, and it reinforces David Simon’s theory of America as Horror Show. What’s more, it was just a small taste of things to come in 2008 with the global financial meltdown at the hands of the world’s most “trusted” financial institutions. Anyway, I learned a bit about how Enron defrauded state’s like California out of tens of billions of dollars through loopholes in the legislation for the recently deregulated energy utility market. Through redirected energy and fabricated shortages, Enron could sell California back it’s own energy at an insane markup (kinda like academic publishers 🙂 ). Enron moved from a company that dealt in natural gas to one which manufactured several high-profile gimmicks while hiding its losses in order to trump up its stock value. The Wall Street analysts had as muc h to with the Enron scam as anyone. It was basically one big lie cashing in on capital running amok. One of its scams that caught my attention was Enron’s foray into the bandwidth commodity market, in particular teaming up with Blockbuster to deliver on-demand video through their network provider Enron Broadband Services. What’s funny about that is we were talking about the history of the web tonight in The Internet Course looking at the emergenc eof the web, Web 1.0 and Web 2.0. One of the details omitted from that history was the Dot-Com Bubble of the late 1990s. Enron was playing on just that market hype when they made the broadband announcement, and it suggests how their fraud was all about creating a compelling narrative regardless of what was possible (true of the dot-com boom more generally). In fact, broadband was just another utility to be deregulated and you could argue that was what the 30 second commerical is really arguing for. What if broadband was a pork belly? * What if broadband was a basic right, a public utility affordable to everyone so we could avoid the pillaging of the public that was Enron? Paul Bond and I had talked about including this documentary in the True Crime course if we teach it again, and after watching it I would say absolutely. It frames one of the most heinous premeditated crimes committed against the citizens of the U.S. and beyond in the past thirty years: corporate crime kills! * Turns out pork bellies are no longer a commodity anyway. This entry was posted in The Internet Course, True Crime and tagged tic104, truecrime. Bookmark the permalink. After the dot-com bubble burst in early 2000, venture capitalists picked themselves up, dusted themselves off, and looked around to see who had survived. The lesson learned from Amazon, eBay and others was to create the space, the tools, and the rules, and let the customers create the value through volunteer labour (like free reviews). People (effectively, bait) attract other people, who can then be efficiently sold to advertisers one at a time. We have replaced pork bellies. We are eating our own long tail. The internet, like Soylent Green, is people (http://goo.gl/VWY4GR)! One of the things I took away from True Crime, and something I think we could have emphasized more, was Lincoln Steffans thesis on political corruption – that it occurs, inevitably, whenever business interests and government get too cozy. We saw that graphically in True Crime with the Harding administration. 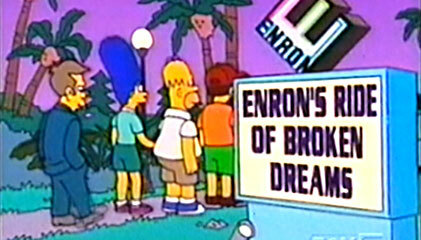 Enron is another illustration, and Simon sees it in today’s environment as well. We could bring the Dot-Com Bubble into the Internet Course when we start talking about social and economic impacts. It’s one of those gaps we should fill in for the class. I love Charlton Heston, no matter what anyone says! Actors don’t kill people; guns kill people. Also, anyone who can play Michelangelo, Moses and John the Baptist can be all bad.